A few month back an artists that I has seen around whom I met at a poker party in the Hollywood Hills was at a show I was involved for the official LA Art Show after party. Her name is Karen Bystedt whom I actually became more aware of her work when I did a mural on the side of a building in Hollywood that had a mural of another artists that she had teamed up with on right next to it. Also when I was doing my first solo show at the Bruce Lurie gallery they mentioned that when she did the show with Chris Brown, there was a large amount of people that showed up. Back to the night I ran into her again, she saw the artwork I did as a tribute to Maddona, and the other tribute work I did for the Artists Baquiat. She asked what I thought about teaming up with her, and taking a high res image of Andy Warhol, and making into a collaboration work made from any number of images she had from her famed The Lost Warhol Series that garnished international exposure. Being that I had been thinking at some point I was going to do a Warhol tribute work, I accepted, and started on it a few days later. Plus I was very impressed how she not only took these amazing photos, but how she had morphed it into this broad collective of amazing works spawned from what she was originally was able to accomplish with her photography skills added in with an art legend. I was googling Art and Andy Warhol and I saw him wearing a tux in one of the photographs. I also knew that he himself is an accomplished photographer, and I wanted to some how incorporate that in the work, so I took a photo of my own hand as though I am holding a classic medium format film. The fun thing was when I showed Karen, she said that was the same film she used when she took his photos! I placed everything next to me and started constructing his face based on the structure of one of my favorite shots of him, however I had to do the messy hair, plus it gave me a chance to show off some of my detailed collage work cutting out all the strands of hair from the books I bought about his life, along with some recycled magazines. I finished the work just in time for her big showcase that she was doing right in the heart of Down Town Los Angeles. The Do Not Enter Gallery was hosting the event in the amazing Pacific Mutual Building, a Beaux-Arts gem across from Pershing Square, and there was an awesome turn out featuring one of the most eclectic group of people that really embodied the spirit of amazing art! I made a fun little video of it, chick here to view it. 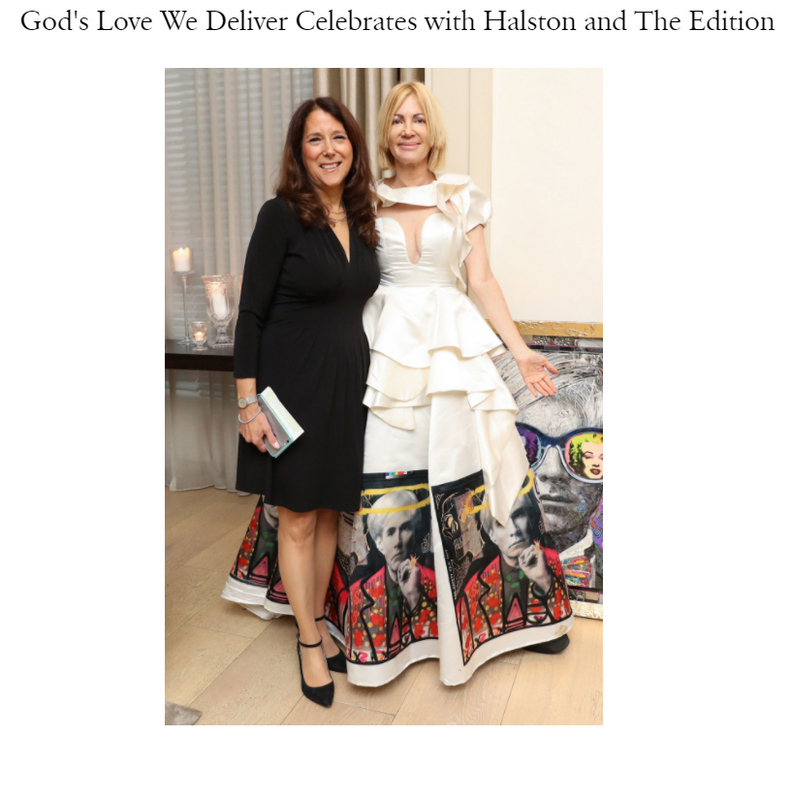 She Said there was a great response to the work we did, and chose it to bring with her to the Gods Love We Deliver event they were putting on with The Edition Hotel New York to honer Studio 54 and the 30th year anniversary of Andy Warhol’s Death. I was really sad that I couldn’t make it, but Karen kept texting back and fourth about how cool it was. She had told me that Vogue Magazine might be at the event, but I didn’t believe her at the time till I saw her post this image on her Instagram page. I was super excited to see a photo of here and Karen Pearl at the event with my art in the background, so reposted her post to let my friends know how cool I thought it was. 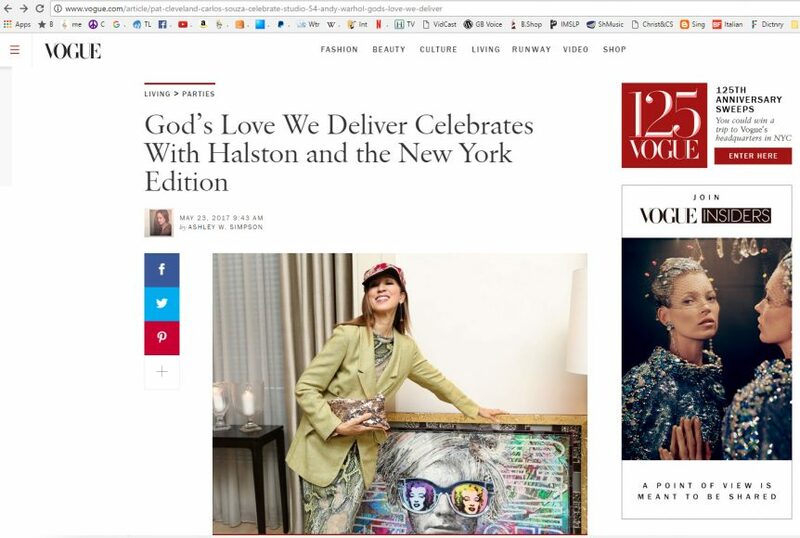 When I went on Vogue.com and found the article, I was amazed to see a photo of Pat Cleveland striking a Vogue inspired pose against the art we did on the first page of the article! I grew up hearing the stories about Studio 54, Andy Warhol, and I always fantasized about being apart of it all. In some little way this has allowed me to participate in something cool, something only the greatest city on earth could garnish, and that is New York City BABY!